Myne Whitman Writes: My Oga at the Top - Which Side are You On? 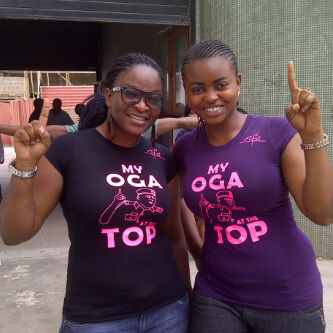 My Oga at the Top - Which Side are You On? I said it before that I actually pity the NSCDC commandant that his TV Interview fumble went viral because none of us is above mistakes. I think we took the joke too far, the man is mediocre, he lies and he is an unrepentant incompetent, true, but should the reporters have magnified all this with the website question? I don't know. Do you think all his ogas at the top did not see all this before he was made a commandant? The man is simply a sympton of what ails the Nigerian bureaucracy, and simply mocking him helps nothing. There has been some reports that he was suspended, but they are unconfirmed and there are other reports seemingly from the NSCDC that says he hasn't. I read a few posts today that got me thinking of this issue again, the main one being an article on Naijastories in defense of the commandant. Mr. Obafaiye Shem did not grow up in the internet-age. He never had to google a difficult concept for his assignments. He probably keeps an address book and diary for important places, and if you ask him for the physical address of his office, he most likely knows it. He grew up learning physical addresses, not web addresses. He is no different from today’s children who have stored thousands of web addresses in their memory, yet do not know their house number, and have to make several phone calls when filling their physical address in a form. Maybe we needed this incident to remind us of the technology disconnect – the digital divide that separates cultures, and generations. How many offices in the civil service have computers? Shem’s ignorance of the organization’s website is the lesser evil, and we still remain blinded to the real issues. We have sensationalized the issue, creating tunes, tee-shirts and baseball caps to distract us from the real problems we have. The question should not be “How could he not know the website?” It should be “What is the state of information technology diffusion in the civil service?” Do you know that the Nigerian Police Force does not keep a computerized database? Have you realized that when cases are reported, they keep the records in loose sheets that can be blown away by the wind? Efadel got some robust comments to her piece, from readers who disagreed and felt that the outrage was justly deserved. Well, I’ll totally go the opposite direction. Shem is a COMMANDANT and therefore deserves what he got. He didn’t know or forgot NSCDC website which is supposed to be a friendly platform for communicating with the public. His ignorance of the website is an insult to the public because it shows we never mattered to them. What the public did was only to send a message to them that we do matter. That is not what even bothers me in his gaffe. What bothers me is the way he handled the situation, like some primary school boy who is afraid of his papa. How would such persons handle sensitive and urgent matters required of him as a leader? About the journalists, they did nothing wrong. They were simply educating the public on the kind of individuals at the helm of important and sensitive government organisations like NSCDC. No wonder this organisations contribute nothing to the development of the nation. Channels TV did well by not playing down the issue. As small as you think Shem’s gaffe is, it says a whole lot more. Masking this kind of things is the major reason we don’t move forward. The same thing happened to ex-Italian President, Mccain, Patience etc and they were fried for it. So why defend Shem. It’s unfortunate he had to be suspended after displaying his unflinching loyalty to his Oga. An officer from the same NSCDC mentioned Nairaland as a list of websites created to offer sham job recruitment offers to the public. So you see, this is not an individual thing. The whole NSCDC operates in ignorance. Thank god for journalism, if not we wouldn’t have known. His incompetence is just a glimpse into the massive level of mediocrity that is pervasive in our leadership, and it shouldn’t be overlooked or swept under the carpet. if it was, then we would be celebrating incompetence and mediocrity. Let’s crucify him so that the leaders and those aspiring to leadership will embrace the culture of excellence. if we don’t then there’s no hope for tomorrow. ... I love the viral nature of the spread of the ridicule, it’s a message to the government and those in power, we are watching you! we won’t hesitate to wash you if you mess up. that’s the nature of democracy, the judgement belongs to the people, power belongs to the people and the leaders are only custodians. Now all public officials granting interviews from henceforth will go prepared and watch what they say and not just coming on air to insult our intelligence with their rubbish. we aren’t dumb! Ginger also blogged her own opinion, and thinks he should come back to the public and apologise and also give the correct website details.